Was it worth the wait? We think so. The amber beads are just as fantastic as I expected them to be- & now I have some ideas for combinations of mat & amethyst beaded pieces that may come to fruition in the spring. It’s funny, you would think January would be comparatively calm after the holiday season- & it is, but this is a very very busy time of year for us in so many other ways- all the internal paperwork, plans to launch, new collections to line up. The amount of work that goes into running a small business behind the scenes is pretty incredible- without realizing you must become become a reluctant software expert, shopping cart programmer, press officer, inventory specialist, web designer, PR contact, show scout, graphic designer- really, about a hundred things I can think of. & (note to self:) for example, when there is no fax ribbon, you really only have yourself to blame. Anyway, I’m looking forward to working with these because just looking at them is deeply calming- & centering. Life can become so unbelievably frantic it is easy to get sidetracked. The overall very best thing of all about these is how these amber beads almost immediately take on the warmth of your skin, unlike glass or other gemstones such as turquoise, which will rest at room temperature. These are sea ambers- soft polished nuggets stitched into incredible compositions, they somehow seem fit for a barbarian queen. & yet at the same time they are sooooo modern & beguiling, just an absolute rebuke to unfelt corporate jewelry. & it is also curious how something so small, yet ornate, is so light- because these are substantial pieces. The second best thing about these is how they contain absolutely no metal whatsoever, they seem like they are held together by magic, or a wish. The hand-crocheting is a little stretchy, but surprisingly strong & featherlight. 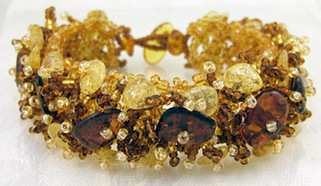 It’s a beautiful way to work with amber, it feels ancient & out of time. These are easy to get lost in-which is how it should be.